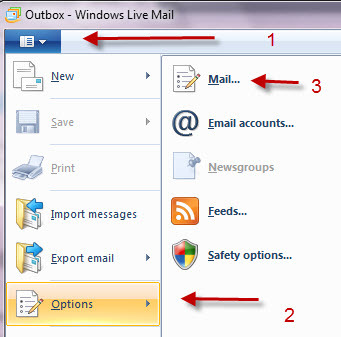 The main configurations settings for Windows Live Mail are found under options. The Options menu should open. If you are familiar with outlook Express you should be very familiar with this screen. Here is a video that explains the most important Options. General> Sending and Receiving Email Interval – When new email arrives on the email server the client isn’t notified. The client must periodically check the email server for new messages . Don’t set to less than 5 minutes. Signatures>Email signatures– If you need to include graphics i.e. a logo in the signature then you need to create it as an external file. Read>automatically expand grouped messages – This is used as part of the conversations settings which you must first turn on. Spelling>Languages – Set you default language for the spell checker. Advanced>maintenance>Store Folder – change where the client stores your email. Not normally changed, but used to find location when doing moves. Advanced>maintenance>Purge Deleted messages when Leaving IMAP folders – Not enabled by default and not needed on Windows live mail, but you usually need to enable this on other clients that mark messages as deleted (a line appears through the message) but don’t delete them unless you purge them.